International Medical Graduates (IMG) remain integral to the Australian health workforce, particularly in rural areas. Stakeholders who recruit, support and acts as educators assist IMGs in their transition into and through the Australian health care setting. 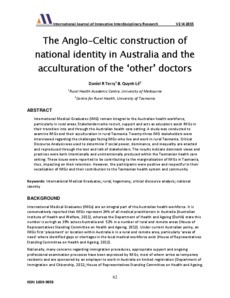 A study was conducted to examine IMGs and their acculturation in rural Tasmania. Twenty-three IMG stakeholders were interviewed regarding the challenges facing IMGs who live and work in rural Tasmania. Critical Discourse Analysis was used to determine if social power, dominance, and inequality are enacted and reproduced through the text and talk of stakeholders. The results indicate dominant views and practices were both intentionally and unintentionally produced within the Tasmanian health care setting. These issues were reported to be contributing to the marginalisation of IMGs in Tasmania, thus, impacting on their retention. However, the participants were positive and respectful in their vocalisation of IMGs and their contribution to the Tasmanian health system and community.